Capsules, tablets and powder for oral suspension of amoxicillin are intended for oral administration. 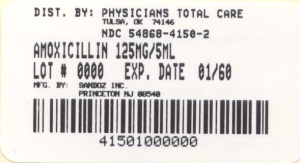 Each amoxicillin capsule, with yellow opaque cap and body, contains 250 mg or 500 mg amoxicillin as the trihydrate. The 250 mg capsule is imprinted AMOX 250 on one side and GG 848 on the other side; the 500 mg capsule is imprinted AMOX 500 on one side and GG 849 on the other side. Inactive ingredients: Capsule shells - yellow ferric oxide, titanium dioxide, gelatin, black ferric oxide; Capsule contents - cellulose microcrystalline and magnesium stearate. Each film coated tablet contains 500 mg or 875 mg amoxicillin as the trihydrate. The tablets are oval-shaped, unscored and white to yellowish. The 500 mg tablet is embossed GG-961 on one side and 500 on the other side. The 875 mg tablet is embossed GG-962 on one side and 875 on the other side. In addition each amoxicillin tablet contains these inactive ingredients: colloidal silicon dioxide, crospovidone, ethylcellulose aqueous dispersion, hypromellose, magnesium stearate, microcrystalline cellulose, sodium starch glycolate, talc, triethyl citrate, and titanium dioxide. Amoxicillin is stable in the presence of gastric acid and is rapidly absorbed after oral administration. The effect of food on the absorption of amoxicillin from the tablets and suspension has been partially investigated. The 400 mg and 875 mg formulations have been studied only when administered at the start of a light meal. However, food effect studies have not been performed with the 200 mg and 500 mg formulations. Amoxicillin diffuses readily into most body tissues and fluids, with the exception of brain and spinal fluid, except when meninges are inflamed. 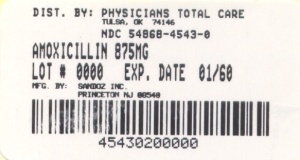 The half-life of amoxicillin is 61.3 minutes. Most of the amoxicillin is excreted unchanged in the urine; its excretion can be delayed by concurrent administration of probenecid. 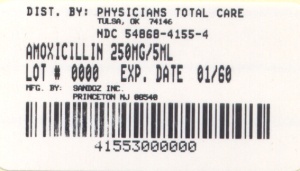 In blood serum, amoxicillin is approximately 20% protein-bound. 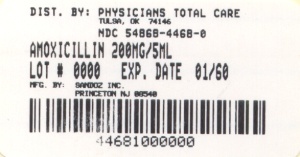 Orally administered doses of 250 mg and 500 mg of amoxicillin capsules result in average peak blood levels 1 to 2 hours after administration in the range of 3.5 mcg/mL to 5 mcg/mL and 5.5 mcg/mL to 7.5 mcg/mL, respectively. Mean amoxicillin pharmacokinetic parameters from an open, two-part, single-dose crossover bioequivalence study in 27 adults comparing 875 mg of Amoxicillin tablets with 875 mg of amoxicillin and clavulanate potassium showed that the 875 mg tablet of amoxicillin produces an AUC0-∞ of 35.4 ± 8.1 mcg∙hr/mL and a Cmax of 13.8 ± 4.1 mcg/mL. Dosing was at the start of a light meal following an overnight fast. Orally administered doses of amoxicillin suspension, 125 mg/5 mL and 250 mg/5 mL, result in average peak blood levels 1 to 2 hours after administration in the range of 1.5 mcg/mL to 3 mcg/mL and 3.5 mcg/mL to 5 mcg/ mL, respectively. S. pneumoniae from non-meningitis sources. Culture and susceptibility testing should be obtained in patients who fail triple therapy. If clarithromycin resistance is found, a nonclarithromycin-containing regimen should be used. Infections of the ear, nose, and throat - due to Streptococcus spp. (α- and β-hemolytic strains only), S. pneumoniae, Staphylococcus spp., or H. influenzae. Clostridium difficile associated diarrhea (CDAD) has been reported with use of nearly all antibacterial agents, including amoxicillin capsules, amoxicillin for oral suspension, or amoxicillin tablets, and may range in severity from mild diarrhea to fatal colitis. Treatment with antibacterial agents alters the normal flora of the colon leading to overgrowth of C. difficile. C. difficile produces toxins A and B which contribute to the development of CDAD. Hypertoxin producing strains of C. difficile cause increased morbidity and mortality, as these infections can be refractory to antimicrobial therapy and may require colectomy. CDAD must be considered in all patients who present with diarrhea following antibiotic use. Careful medical history is necessary since CDAD has been reported to occur over two months after the administration of antibacterial agents. High urine concentrations of ampicillin may result in false-positive reactions when testing for the presence of glucose in urine using Clinitest®, Benedict's Solution, or Fehling's Solution. Since this effect may also occur with amoxicillin, it is recommended that glucose tests based on enzymatic glucose oxidase reactions (such as Clinistix®) be used. Longterm studies in animals have not been performed to evaluate carcinogenic potential. Studies to detect mutagenic potential of amoxicillin alone have not been conducted; however, the following information is available from tests on a 4:1 mixture of amoxicillin and potassium clavulanate. Amoxicillin and potassium clavulanate was non-mutagenic in the Ames bacterial mutation assay, and the yeast gene conversion assay. Amoxicillin and potassium clavulanate was weakly positive in the mouse lymphoma assay, but the trend toward increased mutation frequencies in this assay occurred at doses that were also associated with decreased cell survival. Amoxicillin and potassium clavulanate was negative in the mouse micronucleus test, and in the dominant lethal assay in mice. Potassium clavulanate alone was tested in the Ames bacterial mutation assay and in the mouse micronucleus test, and was negative in each of these assays. In a multi-generation reproduction study in rats, no impairment of fertility or other adverse reproductive effects were seen at doses up to 500 mg/kg (approximately 3 times the human dose in mg/m2). An analysis of clinical studies of amoxicillin was conducted to determine whether subjects aged 65 and over respond differently from younger subjects. Of the 1,811 subjects treated with amoxicillin capsules, 85% were < 60 years old, 15% were ≥ 61 years old and 7% were ≥ 71 years old. This analysis and other reported clinical experience have not identified differences in responses between the elderly and younger patients, but a greater sensitivity of some older individuals cannot be ruled out. Patients should be counseled that antibacterial drugs including amoxicillin should only be used to treat bacterial infections. They do not treat viral infections (e.g., the common cold). When amoxicillin is prescribed to treat a bacterial infection, patients should be told that although it is common to feel better early in the course of therapy, the medication should be taken exactly as directed. Skipping doses or not completing the full course of therapy may: (1) decrease the effectiveness of the immediate treatment, and (2) increase the likelihood that bacteria will develop resistance and will not be treatable by amoxicillin or other antibacterial drugs in the future. Hypersensitivity Reactions: Anaphylaxis (See WARNINGS), Serum sickness-like reactions, erythematous maculopapular rashes, erythema multiforme, Stevens-Johnson syndrome, exfoliative dermatitis, toxic epidermal necrolysis, acute generalized exanthematous pustulosis, hypersensitivity vasculitis and urticaria have been reported. Capsules, tablets and oral suspensions of amoxicillin may be given without regard to meals. The 400 mg suspension and the 875 mg tablet have been studied only when administered at the start of a light meal. However, food effect studies have not been performed with the 200 mg and 500 mg formulations. Gonorrhea Acute, uncomplicated ano-genital and urethral infections in males and females 3 grams as single oral dose Prepubertal children: 50 mg/kg amoxicillin, combined with 25 mg/kg probenecid as a single dose. It should be recognized that in the treatment of chronic urinary tract infections, frequent bacteriological and clinical appraisals are necessary. Smaller doses than those recommended above should not be used. Even higher doses may be needed at times. In stubborn infections, therapy may be required for several weeks. It may be necessary to continue clinical and/or bacteriological followup for several months after cessation of therapy. Except for gonorrhea, treatment should be continued for a minimum of 48 to 72 hours beyond the time that the patient becomes asymptomatic or evidence of bacterial eradication has been obtained. It is recommended that there be at least 10 days' treatment for any infection caused by Streptococcus pyogenes to prevent the occurrence of acute rheumatic fever. Patients with impaired renal function do not generally require a reduction in dose unless the impairment is severe. Severely impaired patients with a glomerular filtration rate of <30 mL/minute should not receive the 875 mg tablet. Patients with a glomerular filtration rate of 10 to 30 mL/minute should receive 500 mg or 250 mg every 12 hours, depending on the severity of the infection. Patients with a less than 10 mL/minute glomerular filtration rate should receive 500 mg or 250 mg every 24 hours, depending on severity of the infection. Store capsules, tablets and unreconstituted powder for oral suspension at 20°-25°C (68°-77°F). [See USP Controlled Room Temperature]. Dispense in a tight container. 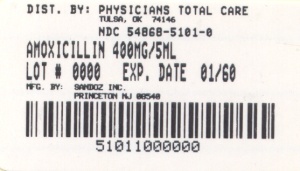 Triple Therapy: Amoxicillin 1 gram twice daily/clarithromycin 500 mg twice daily/lansoprazole 30 mg twice daily. Dual Therapy: Amoxicillin 1 gram three times daily/lansoprazole 30 mg three times daily. (p<0.05) versus lansoprazole/amoxicillin and lansoprazole/clarithromycin dual therapy. (p<0.05) versus clarithromycin/amoxicillin dual therapy. (p<0.05) versus lansoprazole alone or amoxicillin alone. National Committee for Clinical Laboratory Standards. Methods for Dilution Antimicrobial Susceptibility Tests for Bacteria that Grow Aerobically – Fourth Edition; Approved Standard. NCCLS Document M7-A4, Vol. 17, No. 2. NCCLS, Wayne, PA, January 1997. National Committee for Clinical Laboratory Standards. Performance Standards for Antimicrobial Disk Susceptibility Tests – Sixth Edition; Approved Standard. NCCLS Document M2-A6, Vol. 17, No. 1. NCCLS, Wayne, PA, January 1997.